Peterborough United manager Darren Ferguson believes the race for the final League One play-off spot will go down to the last match of the season. Posh briefly jumped back into the top six following a welcome 2-0 win over Southend at the ABAX Stadium last weekend. But they were overtaken by Grant McCann’s Doncaster side on Tuesday after their 4-1 win over Bristol Rovers. Doncaster are now two points ahead of Posh and both teams have seven games left to play. Blackpool and Coventry are also in touch with the play-off places and both could overtake Ferguson’s men on Saturday (March 30). “There will be more twists and turns before the end of the season,” Ferguson said. “It could well go down to the wire. Posh are without a game this weekend because scheduled opponents Portsmouth are taking on Sunderland in the Checkatrade Trophy Final at Wembley on Sunday. That gives Blackpool (home to Plymouth) and Coventry (away to Barnsley) the chance to overtake seventh-placed Posh if they win their Saturday matches. 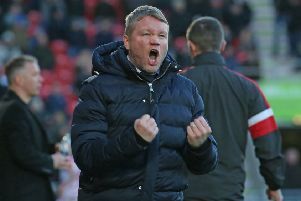 Doncaster will extend their advantage over Posh to five points if they beat struggling Walsall at the Keepmoat Stadium. Posh, who return to action with a League One home match against Gillingham on April 6, would though have a game in hand on all three of their main play-off rivals. Doncaster’s remaining fixtures loook the friendliest which is one reason why Sky Bet make them 1/4 to finish in the top six. Five of Doncaster’s final seven opponents ae currently in the bottom half of League One. Six of Posh’s last seven opponents are currently in the top half of League One. Posh are 9/2 with Sky Bet to finish in a play-off place with Blackpool (8/1), Coventry (10/1), Fleetwood (16/1) and Burton (20/1) also listed. Posh visit Blackpool (April 13) and Fleetwood (April 19) in back-to-back away trips and finish with a home game against Burton on Saturday, May 4 (5.30pm kick off). Posh have rearranged their trip to Portsmouth for Tuesday, April 30.